Configuration in PicketLink is in essence quite simple; an IdentityConfiguration object must first be created to hold the PicketLink configuration options. Once all configuration options have been set, you just create a PartitionManager instance passing the previously created configuration. The PartitionManager can then be used to create Partition and IdentityManager instances. The IdentityConfiguration is usually created using a Configuration Builder API, which provides a rich and fluent API for every single aspect of PicketLink configuration. The default configuration is very useful for developing and testing purposes, as you don't need a database or a LDAP server to start managing your identity data. The example above produces two distinct configurations: one using a JPA store and another using the LDAP store. During the startup PicketLink will resolve both configurations and initialize the IDM subsystem with them. You can also provide a single configuration. When producing IdentityConfiguration instances the produced bean must be dependent and not normal-scoped. For last, you can also build your own PartitionManager instance if you want more control. The example above allows you to produce your own PartitionManager instance. Note that the producer method is annotated with the PicketLink annotation. You may be asking which approach is recommended, right ? We always recommend to use the last approach, observe the SecurityConfigurationEvent. The reason is because from this event you have access to not only the IDM config but for others features provided by PicketLink. However you may want to provide your own PartitionManager instance, instead of relying on PicketLink to create one for you. In this case you can produce a PartitionManager by your own. Or if you want different methods for each IDM config you may want to produce IdentityConfiguration instances instead. You may need to initialize the PartitionManager with some data before your application starts to produce partition manager instances. PicketLink provides a specific event called PartitionManagerCreateEvent, which can be used to provide any initialization logic right after a PartitionManager instance is created and before it is consumed by any injection point in your application. One important thing to keep in mind when providing a observer for PartitionManagerCreateEvent is that if any partition is created during the initialization, PicketLink won't try to create the default partition. Apache TomEE users should always provide an observer for PartitionManagerCreateEvent in order to initialize the partition manager properly. Specially if using the JPA store and if no active transaction exists when the PartitionManager is being created. The Identity Management configuration can be defined programmatically using the Configuration Builder API. The aim of this API is to make it easier to chain coding of configuration options in order to speed up the coding itself and make the configuration more readable. ​// let's add the partition using the default configuration. ​// if no partition is specified to createIdentityManager, defaults to the default Realm. 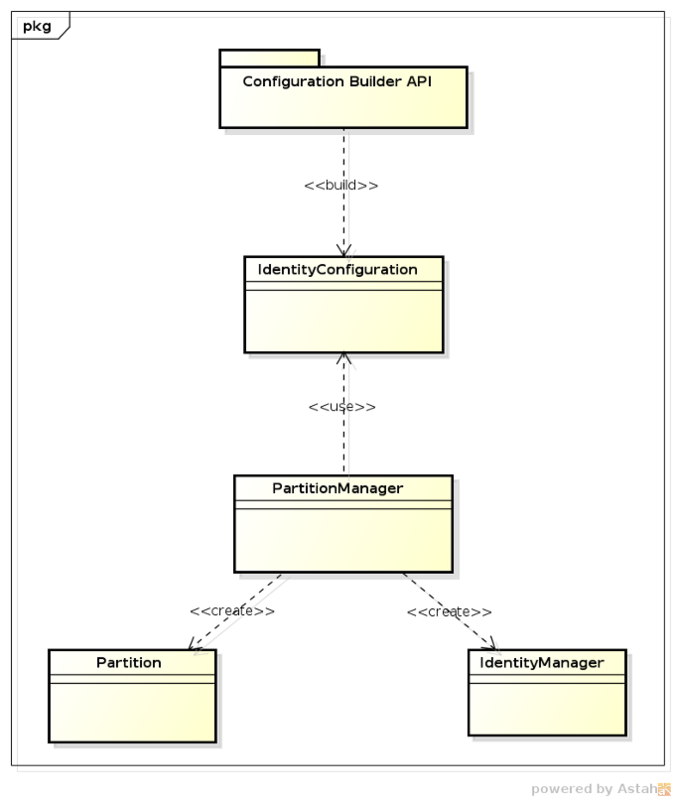 A PartitionManager can be built considering multiple configurations. This is a very powerful feature given that you can manage your identity data between different partitions each one using a specific configuration. As discussed before, each configuration has a name. The name can be used to identify a configuration set as well to tell PicketLink the configuration that should be used to manage a specific Partition. The example above is just one of the different things you can do with PicketLink. The code above defines two partitions: one for internal users and another one for external users. Each partition is associated with one of the provided configurations where the internal partition will use LDAP to store users whether the external partition will use JPA. When you create a IdentityManager for one of those partitions, all identity management operations will be done considering the configuration associated with the current partition. In other words, considering the example above, the user 'john' will be stored in the LDAP and 'mary' in a Database. It is also possible to use multiple IdentityStore configurations in a single named configuration. This can be very useful when your identity data is distributed in different stores or even if a specific store have any kind of limitation that can be provided by another one. For instance, the LDAP store have some limitations and does not support all features provided by PicketLink. One of those unsupported features is the ability to handle ad-hoc attributes. When using LDAP you're tied with a schema that usually is very hard to change in order to support all your needs. In this cases, PicketLink allows you to combine in a single configuration the LDAP and the JPA store, for example. Where you can use LDAP for users, roles and groups and use the JPA store for relationships. The example above defines a single configuration with two stores: LDAP and JPA. For the LDAP store configuration we define that only IdentityType types should be supported. In other words, we're only storing users, roles and groups. For the JPA store configuration we define that only Relationship types should be supported. In other words, we're only storing relationships such as Grant, GroupMembership, etc. You may also notice that the JPA store is configured to support attributes too. What means that we can now use ad-hoc attributes for all the supported types. Each IdentityStore may support a different set of credential handlers. This documentations describes the built-in credential handlers provided by PicketLink, but sometimes you may want to provide your own implementations. The example above shows how to configure a credential handler for a JPA-based store using the addCredentialHandler method. The example above shows how to set a property for the PasswordCredentialHandler using the setCredentialHandlerProperty method. The IdentityContext plays an important role in the PicketLink IDM achitecture. It is strongly used during the execution of operations. It carries very sensitive and contextual information for a specific operation and provides access for some of the IDM underlying services such as caching, event handling, id generator for AttributedType instances, among others. Access the current Partition. Eg. : Realm or Tier. Access the Event Handling API in order to fire events such as when an user is created, updated, etc. Access the Caching API in order to cache identity data and increase performance. Access to external resources, provided before the operation is executed and initialized by a ContextInitializer. Sometimes you may need to provide additional configuration or even references for external resources before the operation is executed by an identity store. An example is how you tell to the JPAIdentityStore which EntityManager instance should be used. When executing an operation, the JPAIdentityStore must be able to access the current EntityManager to persist or retrieve data from the database. You need someway to populate the IdentityContext with such information. When you're configuring an identity store, there is a configuration option that allows you to provide a ContextInitializer implementation. The method initContextForStore will be invoked for every single operation and before its execution by the identity store. It can be implemented to provide all the necessary logic to initialize and populate the IdentityContext for a specific IdentityStore. You can provide multiple initializers. Remember that initializers are executed for every single operation. Also, the same instance is used between operations which means your implementation should be “stateless”. You should be careful about the implementation in order to not impact performance, concurrency or introduce unexpected behaviors. Actually it's possible to configure IDM with XML configuration. This possibility is good especially in case when you want Picketlink IDM to be part of bigger system and your users won't have a possibility to change source code and so they can't configure it programmatically with the Builder API. So they will just need to change the configuration in XML file instead of doing some changes directly in source code. Whole Picketlink project provides unified format of configuration file, so that you can configure Section 14.1, “Overview” and IDM in same file. Note that if you don't want to use Picketlink Federation, you can omit it's configuration and use just IDM. XML configuration is leveraging Section 7.1.5, “Programmatic Configuration Overview” and Java reflection during it's parsing, so names of XML elements are actually same like names of particular Builder methods. You can take a look at testsuite to see more examples. Now you can bootstrap IDM from idmConfigBuilder in same way, like it's done in Section 7.1.5, “Programmatic Configuration Overview” . Note that you can initialize builder from XML file and then you can do some additional programmatic configuration. For example, you may need to programmatically add JPAContextInitializer in case that you are using JPA, because you will need access to JPA EntityManager.